Our second factsheet on tobacco and the Sustainable Development Goals (SDGs) takes a look at the Global Partnership. Next week, the 7. Conference of the Parties of the WHO Framework Convention on Tobacco Control (FCTC) will take place. 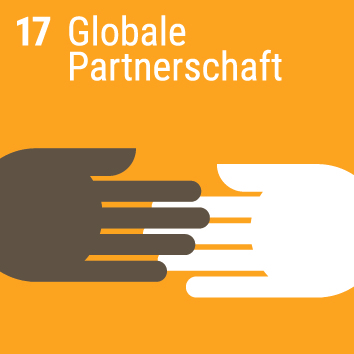 On this occasion we publish our second SDG factsheet titled Tobacco and Global Partnership. The conference in Greater Noida, India, is a place where tobacco control and the Sustainable Development Goal 17 fit together and it becomes apparent how the fair cooperation between 180 states could be effective. This goal has a broad scope and concerning tobacco their are some pitfalls to consider. Pursuing targets such as an increase in exports (17.11) or the expansion of duty-free markets (17.12) would be counterproductive related to tobacco. When used as intended, tobacco kills half os its users. But the core of this SDG – revitalising the Global Partnership – is of utmost importance for tobacco control. Under the umbrella of the WHO FCTC, a truly global partnership is practised since ten years. By enabling international exchange of knowledge, experiences, and technologies, this partnership is showing great progress in the reduction of tobacco use. In 2009, Uruguay introduced graphic health warnings covering 80% of the cigarette packs. 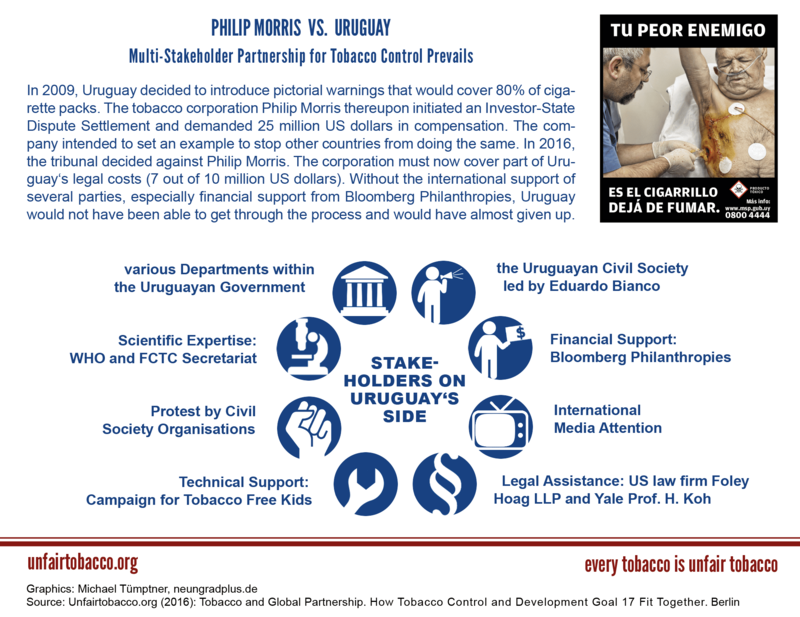 Tobacco giant Philip Morris thereupon initiated an investor state dispute settlement and demanded 25 million US dollars in compensation. In July 2016, the tribunal decided against Philip Morris. The company now has to reimburse a part of Uruguay’s legal costs. Only the international cooperation of many different parties made the success possible. Uruguay wouldn’t have had enough resources to get through the process. The country was financially supported by Bloomberg Philantrophies, got scientific expertise from the WHO and gained support through the protests of civil society organisations all over the world. Still this case is a scandal: a private court has decided whether a country is allowed to protect its population against health risks or not. But if the Sustainable Development Goal 3 “Health for all at all ages” is to be pursued seriously this kind of investment courts should not be part of trade and investment treaties. This would strongly enhance the coherence between different policy fields which is one of the targets of SDG 17. There are also partnerships which are harmful for sustainable development. One example is the New Alliance for Food Security and Nutrition (NAFSN) in Malawi. The resolution demands a comprehensive change of the NAFSN, because it bosts mutlinational corporations – to the detriment of biodiversity and smallholder farmers. Therefore, it is mandatory to impede cooperations with the tobacco industry in multi-stakeholder-partnerships. Because the tobacco industry’s interests are in fundamental and irreconcilable conflict with public health policy and linked to it with food security. There are also partnerships which are harmful for sustainable development.